Common law marriage & relationship lawyer. In Ontario, you are considered to be in a common law relationship if you have been living together as a couple for three years, or for one year if there is a child born from the relationship. Up until a few years ago, common law relationships were treated very differently from marriages in Ontario. Essentially, the breakdown of a common law relationship was treated as an accounting exercise in which the lawyers determined what each partner brought into the relationship and what he or she owned at the end of it, and tried to give each partner what belonged to him or her. This was very different from married couples, who were treated as a unit and were both expected to have a share in all property regardless of who officially owned it. It was especially true of the marital home. In the last few years, this has changed. Today, as long as you both acted as if you were married — for example, if you had joint bank accounts — for the most part, you are treated that way. For example, under the previous way of thinking, if you moved into your partner’s home and lived there for 20 years, at the end of your relationship, you had no rights to the house. Today, it’s often assumed that you have an interest in the house. It is also assumed that failing to give you a reasonable interest might result in “unjust enrichment” for your former partner, since you may have contributed to the family with your time, money, and child care services, but he or she ended up with most of the property that was earned during the relationship. 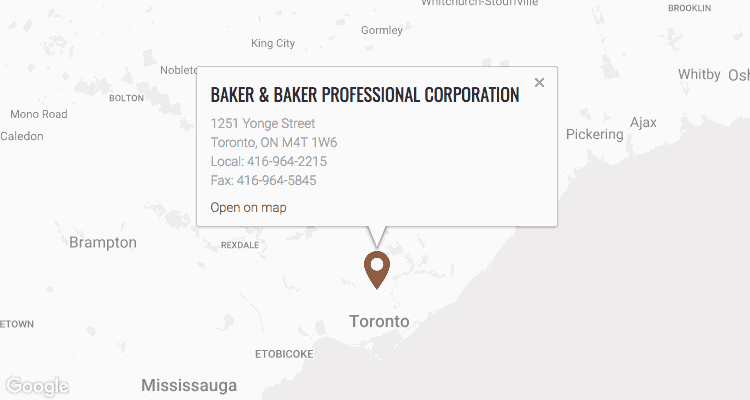 Baker & Baker can help you determine fair and reasonable compensation for all that you gave to the relationship, and help make sure that you are treated fairly under Ontario family law. Looking for a Toronto Common Law Marriage & Relationship Lawyer? If you are not married and are experiencing a breakdown in your common law relationship, contact Baker & Baker at 416-964-2215 or by email. Our Toronto common-law marriage and common law separation lawyers can meet with you and explain your rights under Ontario’s Family Law Act.